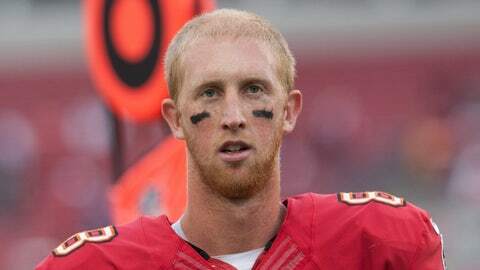 Even with Greg Schiano gone as coach, Mike Glennon is the early favorite to remain the starting quarterback of the Tampa Bay Buccaneers next season. At this time last year, Josh Freeman was coming off a career season in which he threw for 4,065 yards with 17 touchdowns. Fast-forward to the start of another offseason for the Tampa Bay Buccaneers, and the landscape at quarterback looks much different. Freeman is long gone, Mike Glennon remains an unknown and upgrading the backup position stands as one of the largest priorities for Lovie Smith’s new staff. Glennon was a golden boy of the Greg Schiano/Mark Dominik regime, but don’t expect the Smith/Jason Licht duo to be tied as closely to the young talent. This position is an area of need, so Tampa Bay’s new power structure should move aggressively to secure the best depth it can find. No questions asked. Unfortunately for the Bucs, that goal is easier said than done. Their current draft slot (seventh) is just low enough where Johnny Manziel will likely be off the board beyond their reach. With Jay Cutler re-signing with the Chicago Bears, the free-agent market looks slim as well. That means, even with questions surrounding Glennon, the Bucs could start next season at quarterback much like they closed the last. 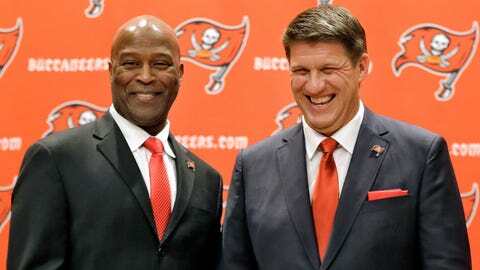 Who will run the Buccaneers? To hear new general manager Jason Licht speak, 'partnership' will be a popular buzzword around One Buc Place. Mike Glennon — As expected, there were highs and lows for the rookie, with consistency elusive for the third-round pick from N.C. State who was asked to do much more than anticipated when he began training camp. He finished with 2,608 yards passing and 19 touchdowns to nine interceptions after replacing Freeman starting in Week 4. Those are respectable numbers, but they fall short of making you say, "No doubt, this is the guy for the future." Still, it would be a surprise if he weren’t the Bucs’ starter come Week 1 next season. Tampa Bay must likely trade up from its No. 7 draft slot to have a chance to snag Johnny Manziel. (Teddy Bridgewater probably won’t last past the first two picks.) And when Josh McCown and Michael Vick are headline options in free agency, you know the pickings are slim. For now, Glennon looks safe, even with Schiano gone. Josh Freeman — Doesn’t it seem like he left five years ago? Freeman entered 2013 with a chance to make big money from the Bucs as their face of the future behind center. Instead, he was benched in September, before being cut in October following a bizarre divorce from Schiano and Dominik. Little about how this played out was good, and Freeman’s story is a sad one when you consider his raw potential. He finished with 571 yards passing with two touchdowns and three interceptions in three starts with Tampa Bay. The Minnesota Vikings took a flyer on him when he started one game, against the New York Giants in Week 7, but he was a disaster in completing 20-of-53 passes for 190 yards with one interception. Who knows where he lands next. Dan Orlovsky — He saw action in two games, against the Atlanta Falcons in Week 11 and the New Orleans Saints in Week 17, but he didn’t record any stats. He’s a nine-year veteran, but the Bucs can do better in free agency or the draft to find someone to push Glennon. That’s what Tampa Bay needs from Smith’s staff in the new regime’s first season: Competition at the quarterback spot from a capable No. 2. Orlovsky doesn’t give the Bucs that option. Finding a stronger backup should be an offseason priority. Josh McCown — Reuniting with Smith would be the Bucs’ best outcome. He has played parts of 11 seasons in the NFL, including three with the Chicago Bears from 2011 to 2013. McCown showed he was capable in backing up Jay Cutler last season, throwing for 1,829 yards with 13 touchdowns and one interception in five starts. Smith has no political capital invested in Glennon’s success, so McCown’s addition would bolster an area of need while giving new coordinator Jeff Tedford a proven asset if Glennon struggles. Johnny Manziel — He represents the Bucs’ best-case scenario in the draft. There are plenty of red flags that come with drafting Johnny Football: Will he be mature enough to lead an NFL locker room? Will he be able to handle himself off the field? But his upside is so great that taking the former Heisman Trophy winner is worth the risk. He’d offer instant excitement, versatility and durability. He’d put people in the stands. There would be a buzz at Raymond James Stadium, and after so many apathetic seasons since the Raheem Morris era began, who wouldn’t welcome the life? Problem is, Manziel probably played himself into a Top 5 draft slot with a strong close to his collegiate career. Securing him could take some creativity on draft day. Aaron Murray — Bringing the former Tampa resident home would be good for the Bucs. The former Georgia quarterback will likely slide to the late rounds because of questions about his rehab from a torn left ACL. If he heals well, Murray could prove to be a steal. He threw for 13,166 yards with 121 touchdowns and 41 interceptions in his career with the Bulldogs. If not for the injury, Murray would be considered one of the draft’s top pro-ready prospects. Unless something drastic happens, Glennon will be the Bucs’ starter to begin the Smith era. That’s not to say he’ll remain that way beyond next season, but at the very least, Tampa Bay needs to bolster its backup situation through free agency or the draft. Though Glennon showed some talent as a rookie, he remains an open-ended question. McCown would be a sound addition. But if McCown’s reunion with Smith doesn’t happen, the Bucs should scout for a possible late-round steal like Murray. The status quo isn’t acceptable.